Printed in colour, soft cover including a fully indexed PDF file is included. 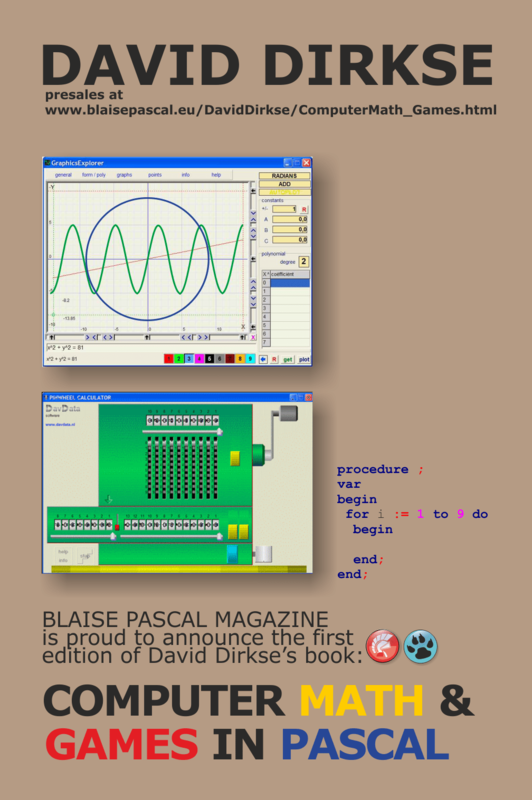 The book contains 87 chapters, 53 projects with source code and compiled programs (executables). You can download all of these projects from your personal page. Learn how to create Computer Graphics, for Windows this is an exceptional and explanatory book. It shows not only how to create Graphics but tells you how to make them very fast…produce 3-dimensional computer art. Draw lines, circles and ellipses. Resize, rotate, compress digital images. Play board games, solve puzzles, operate a vintage mechanical calculator. Generate lists of prime numbers, explore and draw any mathematical function. Solve systems of equations, calculate the area of complex polygons. Generate and reduce Truth Tables from Boolean algebra. And more important: understand how it all works! For the games, winning strategies are explained. For puzzles the search algorithm. For all projects: the math behind is thoroughly discussed. See here and view some of the video examples…. The Delphi (works also under new Delphi Tokyo 2.2 ) source code is available together with full explanation. Most of the projects can be done with FPC and or Lazarus as well. like Windows, Linux, Mac and Android. All of these programs and projects come together with the book.